The Well-Trained Mind will instruct you, step by step, on how to give your child an academically rigorous, comprehensive education from preschool through high school-one that will train him or her to read, to think, to ?understand?, to be well-rounded and curious about learning. 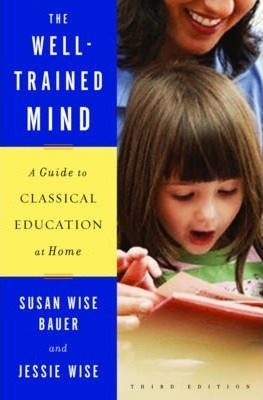 Veteran home educators Jessie Wise and Susan Wise Bauer outline the classical pattern of education called the trivium, which organizes learning around the maturing capacity of the child's mind and comprises three stages: the elementary school "grammar stage," the middle school "logic stage," and the high school "rhetoric stage." Using this theory as your model, you'll be able to instruct your child in all levels of reading, writing, history, geography, mathematics, science, foreign languages, rhetoric, logic, art, and music, regardless of your own aptitude in those subjects. This newly revised edition contains completely updated ordering information for all curricula and books, new and expanded curricula recommendations, new material on using computers and distance-learning resources, answers to common questions about home education, information about educational support groups, and advice on practical matters such as working with your local school board, preparing a high school transcript, and applying to colleges. Susan Wise Bauer is a writer, educator, and historian. Her previous books include the Writing With Ease, Writing With Skill, and Story of the World series from Well-Trained Mind Press, as well as The Well-Trained Mind: A Guide to Classical Education at Home, The Well-Educated Mind: A Guide to the Classical Education You Never Had, Rethinking School, The Story of Western Science: From the Writings of Aristotle to the Big Bang Theory, and the History of the World series, all from W. W. W. Norton. She has a Ph.D. in American Studies from the College of William & Mary in Virginia, as well as an M.A. in seventeenth-century literature and a Master of Divinity in Ancient Near Eastern Languages and Literature. For fifteen years, she taught literature and composition at the College of William and Mary. Jessie Wise, a former teacher, is a home education consultant, speaker, and writer. She has decades of experience as a classroom teacher, elementary school principal, private tutor, and educational consultant, and is the co-author of the best-selling The Well-Trained Mind and the groundbreaking elementary grammar text First Language Lessons for the Well-Trained Mind. She lives in Charles City, Virginia.